Localization can be a little intimidating if you haven’t done it before. Luckily the actual localization project isn’t the difficult part. There are tons of guidance, tools and services available to help you in the localization phase. All the mental work before even deciding to localize is the toughest part of the process. Companies have many reasons to localize. Today when there are so much competition everywhere, spreading the business to abroad is almost mandatory. After making the decision of entering a new market, the company needs to decide how to do it. It is totally fine to keep the current product portfolio but it isn’t the only option. 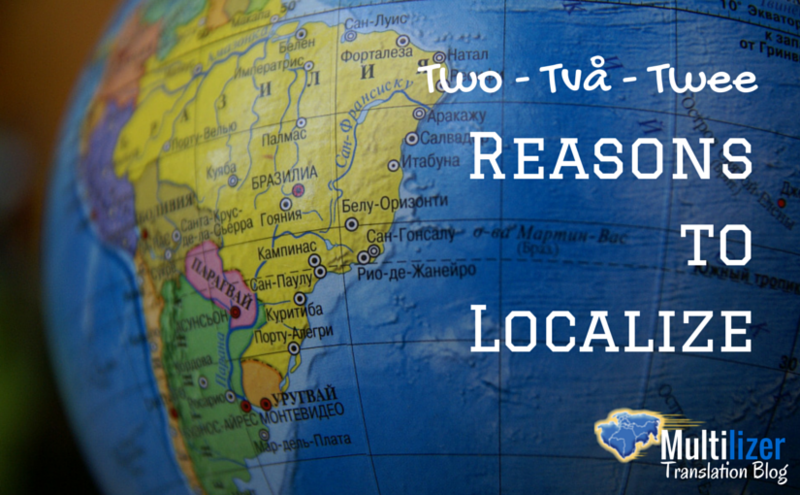 Here are two of the most common reasons to choose the localization option. 1. People can’t use a product or service that they don’t understand. How many times have you used some software application which only speaks Finnish (or Chinese or Swahili or some other language you don’t understand)? Very few of us are ready to spend time and make an effort in order to read something that isn’t available in the right languages. Localization eases the usage and affects the user experience. By making the effort of localizing you show the local people that you care and want to make their lives easier, instead of just being a greedy marketer who is after their money. 2. People won’t buy a product or service that they don’t trust. How many times have you purchased something that feels a little strange or offbeat? For most people it’s easier to leave a store empty handed than buy something that doesn’t feel right. Human emotions are amazing because they have a huge impact on our behavior. We’re not as rational as we’d like to believe. People process information differently when presented in different languages. Localization enables building emotional connections because one’s mother language speaks to his heart while other languages speak to his brains. The first of these two reasons is a no-brainer. Without localization the people in some foreign market area may not be able to understand a word of your message, or there might be too few of them who understand to make any profit. The second reason is to persuade and assure the local people to trust you enough to buy from you. Localization isn’t necessary the ticket to paradise. Sometimes, despite all the right choices and actions, the timing is wrong or there just isn’t enough luck involved. However, when you think about ways to make your business global you need to ask yourself: Can I afford to keep potential customers away? Localization might, after all, be your key to success. Do you make or sell software applications? Software localization isn’t difficult when you know the basics. Learn more about software localization. Previous Previous post: Is Machine Translation Popular?